Cooking and eating at sea is almost like camping on land — except a boat is almost always moving! A boat’s movement, underway or when moored, and the limited space for food stowage and preparation present some challenges for the waterborne chef and passengers on any vessel. With a bit of planning and following the tips below, day trippers or charterers planning an extended cruise can look like champs when cooking and serving food and refreshments on board. 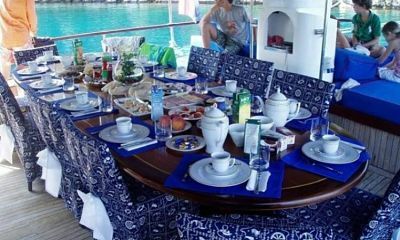 For a one-day trip on a runabout or a day sailer, planning food and beverages is not so much of a concern, as the voyage length is comparatively short and the boat is generally not equipped for cooking. Still, passengers will appreciate food, snacks, and beverages that are simple, easy, filling, and spill-proof. Pre-made, hearty meat or vegetable sandwiches, with condiments added, pre-cut, individually wrapped, and labeled are great ways to save time and effort on board. Let passengers know of food and refreshment plans for the trip; provide guidelines for what and how much to bring to avoid duplication. Pre-packaged, individual-sized snacks and sweets are a quick source of energy and hunger relief. Bring assorted fruits. For fruit that needs peeling, pre-peel and store in resealable bags. Or you can buy inexpensive, space-saving, pre-packaged fruit smoothies. Beverages add significant weight and can affect boat balance and handling. To save space and weight: Place recyclable trash in sturdy, plastic bags and store in an unused bait well or locker. Use a 2.5-gallon water jug with a spigot (and plenty of cups/tumblers) rather than individual water bottles. If using individual bottles, buy smaller (8.5- or 12-ounce) containers. Stow liquids in hatched coolers on the boat’s deck for easy access. Use dry ice or ice packs instead of frozen water. Biodegradable waste like apple cores and fruit peels can be composted when back on shore. When at the dock, dispose of all trash responsibly. For charterers embarking on an extended cruise, provisioning the vessel and on board cooking are important issues, with the added concerns of food freshness, stowage, serving, and safety. Two words cover a multitude of issues: planning and simplicity! Use time at anchor or docked to prepare sandwiches, salads, and other menu items. Check passenger diet restrictions and tastes. Out on the open ocean is not the time to learn passengers are allergic to certain foods. Think “one pot” meals — from beef/chicken stews to pasta or vegetable casseroles. Passengers like “stick-to-the-ribs” types of meals that are filling, easy to serve and eat, and easy to clean up. Depending on locale and weather, thick, hearty soups are popular. Between meals, serve healthy snacks (fruits, nuts, trail mixes, energy bars, etc.). Check galley equipment before buying food; coffee makers, toasters, microwaves, or freezers may not be aboard because of power restrictions. Securely stow all food items. Gear (mesh) nets strung from the overheads in or near the galley are an easy and inexpensive way to stow snacks and fruit. When cooking underway, wear the bib (pants) part of foul weather gear to protect against accidental scalding from an unexpected wave or boat wake. Remember that the world’s largest — and free — fish market is just over the gunwales! Bring along basic fishing gear and fish cleaning utensils. Bring favorite kitchen tools from home, as charter boats are typically equipped with just bare bones and heavily-used kitchen utensils; knives can be especially dull. Purchase off-brand paper products, canned goods, etc. at homeport grocery or warehouse stores — the savings are considerable. Costs for everything are very steep in marina or foreign port stores. Purchase liquids that can be stored at room temperature, like Tetra-pak juices. Like submariners, use perishable foods first and using canned foods as the voyage progresses. In most U.S. states and foreign waters, biodegradable waste (food scraps that can readily decompose) can be dumped overboard with little restriction. Fuel, cooking, and food odors and can bring on “mal-de-mer” in even the heartiest sailors. Have motion sickness tablets or wristbands, stomach-soothing medicines (like Pepto-Bismol), and motion sickness bags available. All onboard will be very thankful! Passenger and boat safety is a critical issue on cruises of any length; on extended trips, particularly when galley equipment or grills are used, safety becomes an even bigger priority. Have the charter representative or owner demonstrate galley equipment operation before departure and brief passengers on galley operation and emergency shut-off valve and fire extinguisher locations. If the stovetop is equipped with gimbal or other hardware, understand how the equipment works to keep pots and other items from moving while underway. Closely follow instructions for cooking on rail-mounted gas or charcoal grills; when in use, have a fire extinguisher within reach. Keep a sharp eye on sharp utensils; they can become dangerous if launched by unexpected vessel movements. Be picky when buying fruits, vegetables, seafood, or meat in foreign ports. Use smell, touch, and sight to determine what is edible. Bringing fruits, vegetables, and meats purchased in foreign countries into the U. S. can result in serious fines or vessel quarantine. Dispose of such items long before entering U.S. territorial waters. Drain all empty containers and spray with disinfectant to eliminate residual odors before stowing. To conserve space, collapse or crush water bottles, cans, and boxes. On the dock, separate and recycle onboard trash responsibly. Food and refreshments during a voyage of any length can make — or break — the trip. The kind of food and beverages available, as well as clean up and food and equipment safety are important issues to consider. Menus that are simple, imaginative, and easy to prepare, eat, and clean up will make the crew and passengers very appreciative of the captain and the cook!